I love love love my Korkers BuckSkins! My wife has the BuckSkin Marys, and we couldn't be happier with them. They are much lighter than expected, like wearing a running shoe, but with awesome ankle support. My wife says these were much more comfortable and easier to walk in than the heavier competitor brand she wore in Wyoming. Our first outing with them was in the Smoky Mountains and they performed fantastic. I was running felt and she was running Svelte soles. Both afforded great traction on slippery rocks. I like how they drain quickly too. It's nice to have all of the sole options available. That will come in handy when we can't wear felt in banned areas. Just carry a bag of soles with several options. No need to haul extra boots. If you are on the fence about Korkers, don't be. Light weight, sturdy, well padded and very comfortable. I wade fish and walk a lot, at the end of the day my feet feel good. Had a defective issue with them. Korker sent me a new pair, no charge and free shipping. Mark F, customer service manager, responded to my e-mails within minutes. Would rate customer service 10 stars. Over the years this is my third pair and I won't be buying any other brand. First use was this past week on the Lower Deschutes. Except for the most slippery large boulders, the boots with the rubber lugs on were stable and worked on other river bottom material and kept me dry. Easy on and off and comfortable. I just finished a fishing expedition with my new Buckskin boots and they are fantastic. Much better, easy-on, easy-off and more comfortable than my previous branded pair. I am also happy to report that I had some difficulty removing the sole to change to the felt addition and I received an immediate email from the service director of Korkers which included an instructional video. Superior customer service! I purchase the boots because of States movement to ban felt. Fish all western states and the interchangeable soles make compliance not even an issue. The boots are lightweight, with good foot/arch support, have a hard toe box to protect from stubbed toes on boulders, and so far have been very durable. 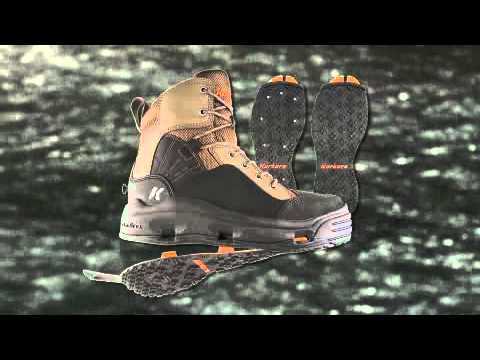 I have been a Sims wading boot fan for 30 years. However, after owning a pair of Korkers, for the price and quality...don't think I'll go back. I've had these boots since Sept '14. No problems whatsoever. I wear a Sz 13 street shoe, and wear these in a Sz 14. Super comfortable, with perfect fit. I would like to see lace hooks instead of holes on the upper laces. Ordered these from Bass Pro, while swapping the sole right out of the box it cracked. Emailed Korkers, had an immediate response with an apology and a new set in the mail. Have had a great time wearing them in some rough cold water here in Atlantic Canada. These are great! I have worn them a couple dozen times this fall and they have been way more comfortable than my last boots. Just order a full size larger than normal. Not just a great boot for the money, a great boot, period. The BuckSkins look great, what I was looking for ! Have not been fishing yet. Have a trip planned,will let you Know. The boot is awesome for the interchangeable bottoms and high ankle support but I did notice that there isn't a lot of flex to the boot itself. Very very stiff boot. Rather than that I'll be using them till I destroy them! Not good in deep mud! As a biologist, I work in and around rivers in a variety of substrates, from boulders to solid concrete to sand, gravel, and occasionally, deep silt/clay. Wish there was a more positive method of "locking" the soles onto the boot, so if it became detached from the bottom it would at least still be in tow and recoverable. I've worn these a total of 3 times. The 2nd time, I lost a Kling-On sole, but recovered it as it was barely hanging on when I got to dry ground. Third time, not so lucky. I didn't notice it missing until I headed back to the vehicle. It is now buried somewhere about 10" into the mud under 2' of 50 degree water.